Concrete Producer Centre Concrete Co.
Placement Contractor Glenn O. Hawbaker, Inc.
Baker Hughes, one of the world's largest oilfield services companies, was in need of more than 11,000 yards of pavement at their new facility that would withstand heavy-duty tractor trailer traffic on a regular basis. Located at the Lamar Township Business Park in Mill Hall, Pa., the facility will support gas exploration in the Marcellus Shale. All factors pointed to concrete as the answer. However, Baker Hughes was looking to move fast and needed something that would allow for a quick turnaround. ~ Rory McCoy, Centre Concrete Co.
With the help of Centre Concrete (producer), Glenn O. Hawbaker Inc. (installation) and A. Martini & Co. (contractor), roller compacted concrete (RCC) was selected because it had all the advantages of concrete, but also offered a speedier placement method. RCC is strong and durable like concrete but is put down like asphalt. It’s placed with conventional or high-density paving equipment and then is finished using double-drum rollers. RCC has a similar ingredient make-up as conventional concrete: water, cement and aggregates such as gravel and crushed stone, but it’s a drier mix that helps it be compacted by the rollers. 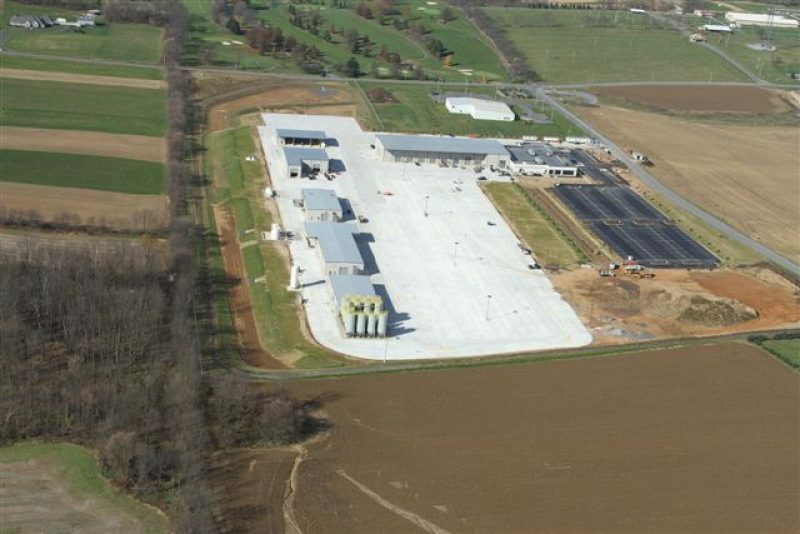 RCC is constructed without the joints, forms and dowels or steel reinforcing typically needed with conventional concrete, allowing for a faster placement time. 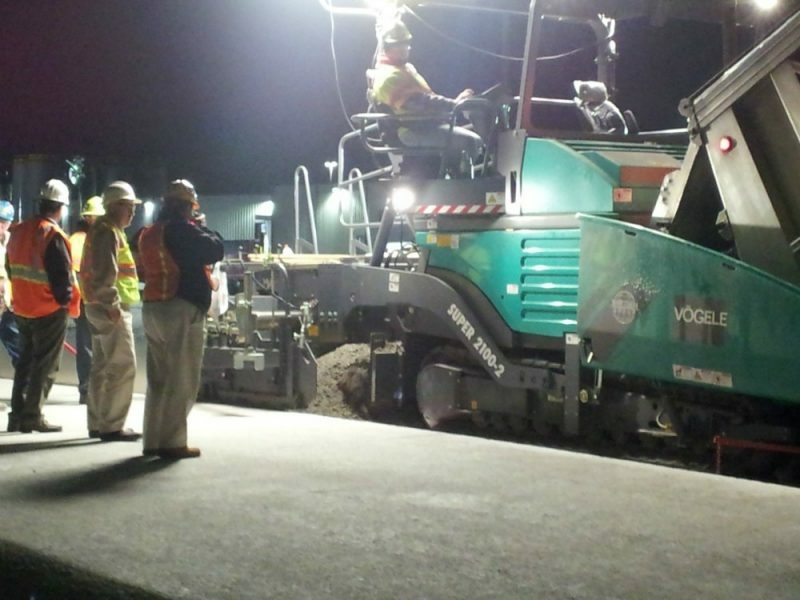 Because RCC provides efficient placement, similar to asphalt, the project was completed in 2-3 weeks and was able to be placed at night to help meet the fast-approaching deadline. Centre Concrete has been working with RCC for the past 10-12 years. "RCC is definitely becoming more popular. We are starting to see more interest from our customers as they are hearing and learning more about it," said McCoy. "I've quoted more RCC projects this year than ever before." "Time is always a critical factor, and very often that can be why concrete isn't chosen for a project. RCC now provides a second option to asphalt; it provides the ability to pave an area with the strength of concrete, but the speed of asphalt." Thanks to RCC’s durability, ease of application and lower cost, it’s becoming the preferred solution for industrial and commercial projects. Ports, intermodal, and military facilities; parking, storage, and staging areas; streets, intersections, and low-speed roads are all perfect candidates for the technology. In addition, low cost continues to draw engineers, owners, and construction managers to RCC.